My name is Samantha Sanchez and I’d like to tell you a little about myself. I am 4 months old and very spoiled! I love to be scratched on the chest and chewing on things I’m not supposed to be chewing on – like my mommy and daddy’s shoes. Very naughty I know, but I can’t help myself! I have an older brother and his name is Underdog. I love to lick his face when he’s sleeping, but of course he gets annoyed and walks away. I love going on car rides with my family because we always go to Petco and leave with a new toy for my brother and I. I love running around the yard chasing leaves. I hate getting bathes. I love my mommy and daddy very much. Congrats again. 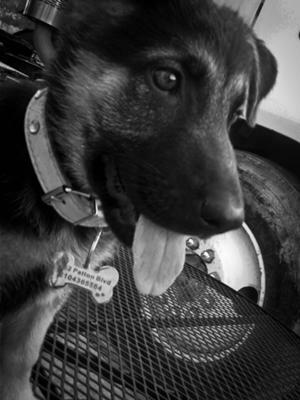 Please read our story total-german-shepherd-puppy/mia story and Mia My Beautiful GSD and update. Thanks. Take care! Your puppy is Gorgeous! I love her name it's so strong just like she will be when she grows up. She sounds like my Mia she will be 2 years on 11/10/11 with all her toys and balls she still loves mommy shoes and socks. Samantha will be your protector, that's just how Shepherd are, it's in their blood. 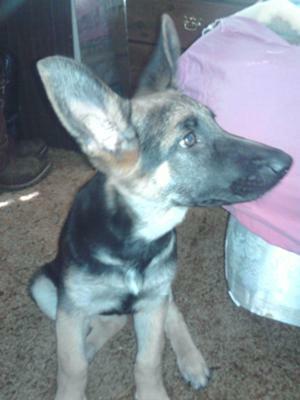 She has a lot of growing to do, to match with those big beautiful ears!!! Good Luck and take care of your baby, Samantha!! !